Here are some very, very large instruments for you to enjoy. They can all be played, although some would need a small army to perform anything feasible. Check out the best below. 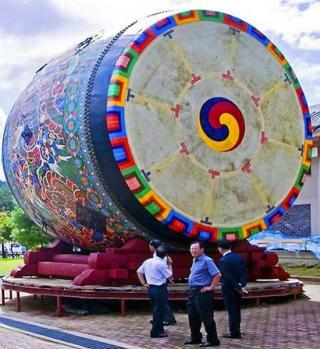 1) World's Largest Single Drum In July of last year the local government of Yeong Dong-Gun in South Korea obliterated the previous record of the largest single drum with a 18-foot-diameter, 20-foot-long traditional Cheon-Go drum. The drum is currently a fixed installation at a local music institute, as its weight of seven metric tons makes it fairly difficult to appear at parades or football games. 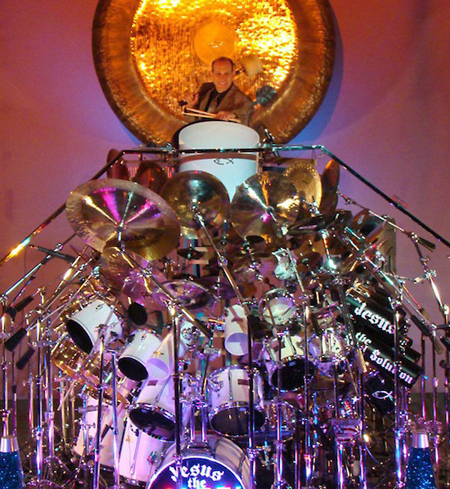 2) World's Largest Drum Kit Containing 90 drums, 80 cymbals, the world’s largest custom-designed symphonic gong, and a total of over 500 pieces, the drum kit of Rev. Dr. Mark Temperato is so absurdly large and powerful that it is somewhat dangerous to play. 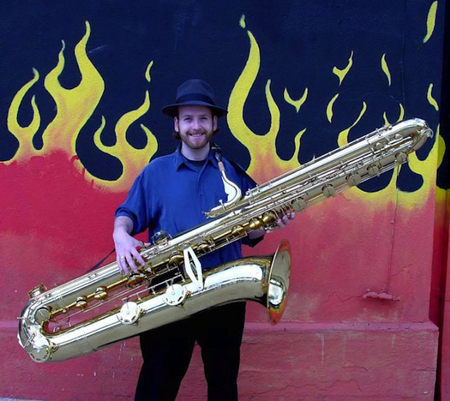 3) World's Largest Brass/Woodwind Instrument This beast stands at a height of between six and seven feet tall - weighing around 45 pounds. Only thirty of these super-saxes were built over the past eighty or so years, but resurgence of interest in the instrument has lead to some new production. 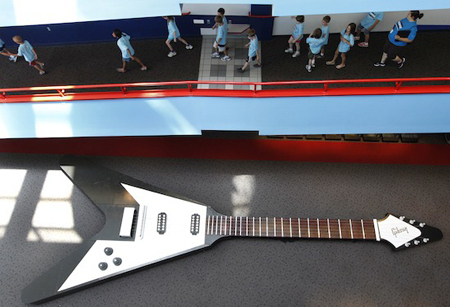 4) World's Largest Playable Guitar (technically..) On the atrium floor of Pittsburgh’s Carnegie Science center lies a 43.5-foot-long Gibson Flying V. Unfortunately, nobody has figured out how to play anything coherent on it, which would require a tightly coordinated team of people with alot of time on their hands. 5) World's Largest String Instrument The Earth Harp is a set of two portable steel structures that are connected by twelve custom-built metal cables of a thousand feet in length, created by William Close. The first Earth Harp performance in 1999 spanned a small valley between two mountains, but subsequent performances have taken place in all sorts of landscapes: canyons, cityscapes, and the flat desert of the Burning Man festival.